We are not living in the first universe. There were other universes, in other eons, before ours, a group of physicists has said. Like ours, these universes were full of black holes. 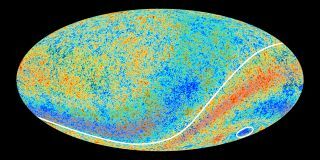 And we can detect traces of those long-dead black holes in the cosmic microwave background (CMB) — the radiation that is a remnant of our universe's violent birth. Editor's note: An earlier version of this story referred to the CMB as "radioactive." It is radiation, but it is not radioactive. The story was updated at 9:20 am, EST Aug. 23 to reflect that.